Relational databases are one of the most important technologies supporting today’s information management activities. They are designed to store, organize and explore digital records that not only support but also document day-to-day business operations. Very often, these records are irreplaceable or prohibitively expensive to reacquire by other means rendering the preservation of databases a serious concern. This page focus on workflows, tools and standards to allow information managers to extract, archive and preserve records of information currently managed by relational databases. The most relevant initiatives in this context are the Database Preservation Toolkit, the Database Visualization Toolkit and the SIARD 2.0 preservation format. The following screencast aims to illustrate how all these tools fit together in a full-cycle archiving and preservation workflow for relational databases. More detailed information about these tools and standards can be found on the following sections. 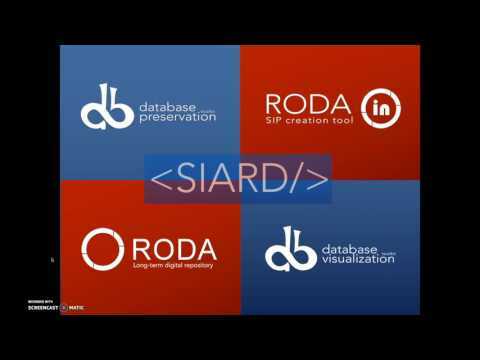 RODA is a complete digital repository solution that delivers functionality for all the main functional units of the OAIS reference model. RODA is capable of ingesting, managing and providing access to the various types of digital content produced by large corporations or public bodies. RODA is based on open-source technologies and is supported by existing standards such as the Open Archival Information System (OAIS), Metadata Encoding and Transmission Standard (METS), Encoded Archival Description (EAD), Dublin Core (DC) and PREMIS (Preservation Metadata). The Database Preservation Toolkit allows conversion between Database formats, including connection to live systems, for purposes of digitally preserving databases. The toolkit allows conversion of live or backed-up databases into preservation formats such as SIARD, a XML-based format created for the purpose of database preservation. The toolkit also allows conversion of the preservation formats back into live systems to allow the full functionality of databases. This toolkit was part of the RODA project and now has been released as a project by its own due to the increasing interest on this particular feature. It is now being further developed in the EARK project together with a new version of the SIARD preservation format. The toolkit is created as a platform that uses input and output modules. Each module supports read and/or write to a particular database format or live system. New modules can easily be added by implementation of a new interface and adding of new drivers. A new version of the this tool, together with a new version of the SIARD preservation format, is currently being designed and developed on the EARK project. Meanwhile, if you’d like to know more and even send us use cases and requirements, contact us. The Database Visualization Toolkit is a lightweight web viewer for relational databases, specially if preserved in SIARD 2, that uses SOLR as a backend, and allows browsing, search, and export. It uses the Database Preservation Toolkit to process new relational databases that are in the SIARD2 format or on the original live DBMS. To use the program, Java JRE 7 or higher needs to be installed. Instructions on how to do this are available at http://docs.oracle.com/javase/7/docs/webnotes/install/. Using this command you will be presented with the application usage, describing all supported modules and their parameters. This information is also available in the application usage page. To use the application an input and an output module must be selected and some configuration parameters must be provided. The Database Preservation Toolkit is also capable of loading preserved databases into any of the above DBMS. If you want to connect to a live MySQL database and export its content to SIARD 2.0 format, you can use the following command. The conversion in the opposite direction is also possible, check the complete application usage to know more about the supported modules and respective configurations. Run Database Preservation Toolkit by providing files to add to the classpath and the main entry point. Please be aware that using this method the conversion quality cannot be assured, as it depends on the used driver. Furthermore, non-tested drivers are more prone to possible errors during the conversion. A specialized module for the database, if available, would always be preferable to this generic JDBC module. Download the latest release or clone the repository. Binaries will be on the target folder. Presentation “Database migration: CLI” by José Ramalho at “A Pratical Approach to Database Archiving”, Danish National Archives, Copenhagen, Denmark, 2012-02-07. Presentation “RODA: a service-oriented digital repository: database archiving” by José Ramalho at “A Pratical Approach to Database Archiving”, Danish National Archives, Copenhagen, Denmark, 2012-02-07. Presentation “RODA - Repository of Authentic Digital Objects” by Luis Faria at the International Workshop on Database Preservation, Edinburgh, 2007. José Carlos Ramalho, Relational database preservation through XML modelling, in proceedings of the International Workshop on Markup of Overlapping Structures (Extreme Markup 2007), Montréal, Canada, 2007. Marta Jacinto, Bidirectional conversion between XML documents and relational data bases, in proceedings of the International Conference on CSCW in Design, Rio de Janeiro, 2002. Ricardo Freitas, Significant properties in the preservation of relational databases, Springer, 2010. Neal Fitzgerald, “Using data archiving tools to preserve archival records in business systems – a case study”, in proceedings of iPRES 2013, Lisbon, 2013. Troubleshooting information can be found in a separate Troubleshooting page. For more information or commercial support, contact KEEP SOLUTIONS. To develop we recommend the use of Maven and Eclipse (or Intellij with Eclipse Code Formatter plugin). To run PostgreSQL tests, a local PostgreSQL database is required and postgres user or another user with permission to create new databases and users can be used. This user must be accessible by IP connection on localhost. The access can be tested with psql -U username -h 127.0.0.1 -d postgres -W.
To run MySQL tests, a local MySQL (or MariaDB) database is required and ‘root’ user or another user with permission to create new databases and users can be used. This user must be accessible by IP connection on localhost. The access can be tested with mysql --user="username" -p --database="mysql" --host="127.0.0.1". Use mvn clean install -Pcommon to locally install the common artifacts so they can be used by other projects. Note that this is not necessary unless you do not have access to KEEPS Artifactory or you want to make changes to the common artifacts to use in other projects. After changing SIARD XML Schema files, maven must be used to compile a new artifact from the XML Schema (using JAXB). To do this, run mvn clean install -Pdbptk-bindings from project root folder. This will install the artifacts locally and they will be used instead of the ones in KEEPS Artifactory. db-preservation-toolkit is maintained by keeps. This page was generated by GitHub Pages.